(POLITICO) -- The Pentagon is reviewing its hairstyle regulations for black women after the Congressional Black Caucus complained the Army had unfairly singled them out in new rules on soldiers’ appearances. Defense Secretary Chuck Hagel sent a letter Tuesday to caucus chair Rep. Marcia Fudge (D-Ohio) and other members assuring them that no one in the Pentagon meant to “discriminate or disparage” black women in formulating the Army’s new rules. Fudge thanked him for his quick response. African Americans make up more than 16 percent of the total military force, according to Pentagon records. About 16 percent of its overall troop population is female. Some examples of new rules for women include allowing bangs — so long as they don’t fall below the eyebrows — and pony tails, as long as they are “centered on the back of the head.” Extensions and wigs are authorized, the Army said, if they conform to the other standards and have the same appearance as natural hair. 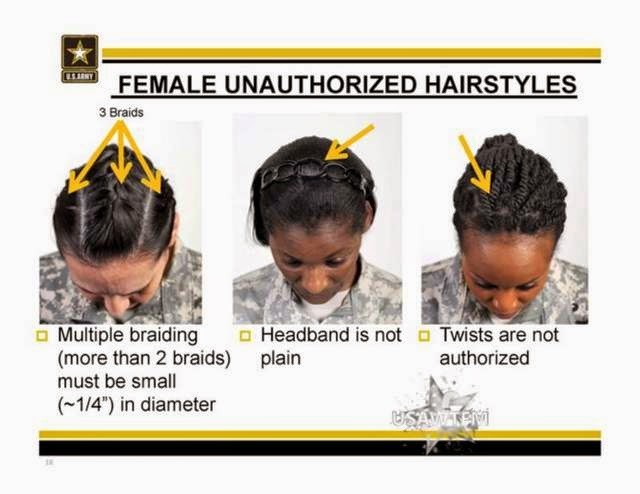 What Fudge and her colleagues objected to was the way the Army’s rules described the way black women may and may not wear their hair.